Posted on Tuesday, June 26th, 2018 at 1:31 pm. Exceptional lightness, rock-solid foot support, heat-moldable fit, replaceable hardware and modern styling would be enough for Bont Cycling’s newest road cycling shoe, the Helix. But the Australian company also adds a revolutionary “twist” on the well-established Boa dial, employing a single, foot-encircling cable that hugs like a slipper and holds like a rivet. While this tester ranked the Helix highly across a litany of traditional performance metrics– not the least of which being a reported 230-gram weight for size 42 – it is the unique, single-dial Boa cable system that marked the shoe’s most memorable feature over many miles on the road and the velodrome. Wrapping from the top of the shoe through the sole beneath, the continuous cable design delivers comfortable and even pressure while facilitating easy and full-foot fit adjustments on the fly. Announced in March 2018, the Helix shares a similar silhouette to Bont’s previous range-topping racing kicks, the Vaypor S. Yet the cosmetic similarities betray significant differences under the surface, with the Vaypor S leveraging a dual-Boa closure across the top of the foot and the Helix, its foot-encircling, single-cable design. “The Vaypor S has been our standard for race fit but I still wanted to find a way to improve upon it, particularly for riders with a low volume foot. The cable integration system has allowed us to keep the weight low, while adding even more to the concept of custom fit. 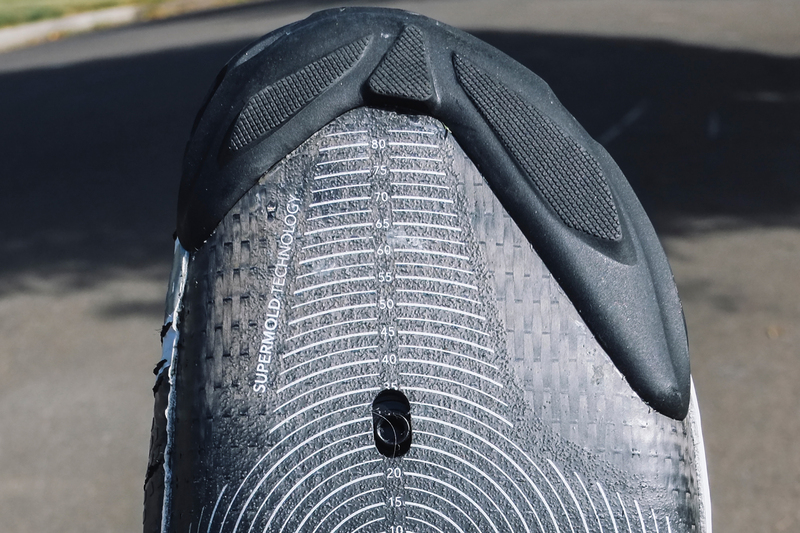 Working with Boa and taking the wire completely around the shoe, we are able to ultimately fine-tune the fit and control the volume adjustment,” said Bont CEO and designer, Steven Nemeth, in the March release announcing the Helix. This quick-to-adjust dial proved very convenient between efforts at Portland Oregon’s Alpenrose Velodrome, where Bont’s track-specific Vaypor T model is a frequent sight among elite riders. The ability to quickly toggle between extra tightness for races and a more relaxed fit for recovery is a great feature, and the foot-enveloping nature of the closure system nicely distributes the pressure of an extra turn of the dial. Other high-end cycling models might feature a combination of closure systems across the top of the foot, requiring more time and dexterity to ratchet up the fit in the moments before a hard effort. Not so with the Helix, which quickly revealed itself as a track-friendly companion whose design readily drew the curiosity of other riders. It’s not just trackies that can benefit from the Helix single-Boa system. Imagine quickly ratcheting up for extra stability at the foot of a decisive climb, or spending just a moment to dial back a couple notches when you are holding your spot in a paceline. Perhaps owing to Bont’s experience with track-specific footwear, however, the Helix felt extremely solid in sprints. With a bathtub-like shape, the monocoque carbon-fiber sole provides excellent stability by cradling the sides of the foot. This is particularly evident for the rear of the shoe, where the visible part of the sole nearly envelopes the entirety of the heel. The sole also properly angles the arch of the foot in line with the knee for better pedal rotation, and features an intricate grid system for careful placement of the cleat. The shoe’s upper includes a bonded-in, Kevlar-like fabric that prevents stretching and further secures the upward part of the pedal stroke. And within the Helix is a do-it-yourself custom heat molding sole, which further cradles the foot. All of these features add up to a feeling of serious security when a user is really putting down the hammer. But the Helix doesn’t skimp on ventilation either, with mesh intakes integrated into a protective bumper at the front of the shoe and ample perforation above the toes. On long road rides and sunny days, the Helix was noticeably cooler than this tester’s typical high-end cycling footwear. This tester also had the opportunity, unfortunately, to test the Helix’s crash worthiness during an early-season pileup at the track. In a crash that burned through the palm of a glove and most of a kit, the Helix emerged scuffed but totally functional. It’s hard to rank long-term durability in just a few months of testing, but my expectation is high for long-term use of the Helix. Are these the shoes for you? Cycling shoe preferences, like any other piece of apparel, are extremely personal. Bont is very thoughtful in its design approach, using anatomically correct lasts and implementing ideas like a generous toe box. The company also provides an online sizing tool to determine what should work for the buyer. Yet the best test, of course, is one you can do in person. What isn’t up to opinion, though, are the metrics on this shoe. Light, stiff, stable, user friendly…what more can you ask for?